is 57 tons 9 cwts. THE four-coupled locomotive made its appearance at an early date, “Locomotion No. 1” of the Stockton and Darlington Railway being of this type. Still earlier engines had two sets of driving axles, but employed spur gearing or similar devices instead of coupling rods. It was not until nearly twenty-five years after the opening of the Stockton and Darlington that the 4-4-0 first materialized in Great Britain. Yet the four-coupled locomotive with leading bogie, often known as the “American type”, has been more used than any other for express passenger work on British railways. 4-4-0 first introduced for express passenger working, but the period also saw the decisive victory of coal over coke for locomotive purposes in general. The success of the 4-4-0, which was hastened by another development of the period in the shape of the more extended use of the bogie truck, was at first regarded as doubtful by many engineers. Up to then four-coupled engines with wheels not usually exceeding 6 ft in diameter, had been used mainly for ordinary passenger and goods work. Express working was largely entrusted to “singles”, of both the six- and eight- wheeled variety. But the growing weight and speed of express trains were beginning to demand larger and more powerful engines. DESIGNED FOR THE MIDLAND RAILWAY by S. W. Johnson towards the end of the last century, this class of 4-4-0’s had cylinders 18½-in by 26-in. Driving wheels were 7 ft in diameter. Total heating surface was 1,223 sq ft, grate area 19.6 sq ft, and boiler pressure 160 lb per sq in. Total weight of the engine in working order, without tender, amounted to 44 tons 5½ cwt. The Great Western, which had been a pioneer in the use of eight-wheeled “singles” of the non-bogie type, was also the first to introduce the 4-4-0 for fast passenger work. This came in 1855, when the Stephenson factory built ten engines of the “Coeur de Lion” type, with 17 by 24 in inside cylinders, and 7 ft driving wheels. These were the first locomotives with 7 ft coupled driving wheels to be used in the United Kingdom. As with the “single” eight-wheelers of the “Lord of the Isles” class, these engines did not have bogies; the two pairs of leading wheels have a rigid wheelbase. This class was built to haul fast trains between Swindon and South Wales, on some sections of which line the gradients are severe. There were no successors to the original ten, and, although they never distinguished themselves greatly in the matter of speed, they proved useful in heavy passenger service. They must certainly have had their points, since the average mileage before breaking up was only slightly less than 480,000. 4-4-0’s for some South American railways. The next British railway to be associated prominently with the 4-4-0 was the Stockton and Darlington, for which the Stephenson works built two types in 1860 and 1862. The first class, of which there were two examples, had outside cylinders and 6 ft coupled wheels. The engines were characterized by a feature unusual at that date, namely large and roomy cabs, which in general design were similar to the standard pattern subsequently introduced on the North Eastern Railway. The reason for this cab was that these two engines were built for the exposed section of line over the Pennine range between Darlington and Tebay (Westmorland). A NORTH EASTERN EXPRESS ENGINE of 1896, designed by W. Worsdell. With the exception of two engines - Nos. 1869 and 1870 - built with larger dimensions, this class of 4-4-0 locomotive had cylinders 19½-in by 26-in, and 7 ft 1-in coupled wheels. The two larger locomotives had 7 ft 7¼-in diameter driving wheels, and cylinders 20-in by 26-in. They were built specially for racing. The 1862 class also had outside cylinders but no cabs. The coupled wheels were of the then exceptional diameter of 7 ft 0½-in, the splashers were pierced, and the dome with its spring valve was strikingly similar in design to that subsequently adopted on the Midland Railway. A feature of these engines was an auxiliary tank for heating the feed water by use of spare boiler steam. Another 4-4-0 class of the period was the London, Chatham and Dover side tank of 1861. Three years later 4-4-0’s with inside cylinders were introduced in Yorkshire on the Whitby-Malton section of the North Eastern Railway, a line with extremely sharp curves, which had previously been worked by four-wheelers. These 4-4-0’s in contrast to the Stockton and Darlington engines, had coupled wheels with a diameter of only 5 ft, an unusually small size for a 4-4-0 tender locomotive. J. Manson. The outside cylinders were 12½ in by 24 in, and the inside cylinders 14½ in by 26 in. Driving wheels had a 6 ft 9½ in diameter. Total heating surface was 1,173 sq in, grate area 18 sq ft, and boiler pressure 165 lb per sq in. The weight of the engine, without tender, was 48 tons 14 cwt. It was not, however, until the ‘seventies that the 4-4-0 really acclimatized itself in Great Britain. Although this type of locomotive had formerly been employed for express service on the Continent, it was late in being adopted to any consider-able extent on the European Railways. Thus, while the standard Paris, Lyons, and Mediterranean Railway express type of 1870 was an eight-wheeler, this was a 2-4-2. Tender locomotives having this wheel arrangement enjoyed for many years a popularity on the Continent that was unknown in Great Britain. 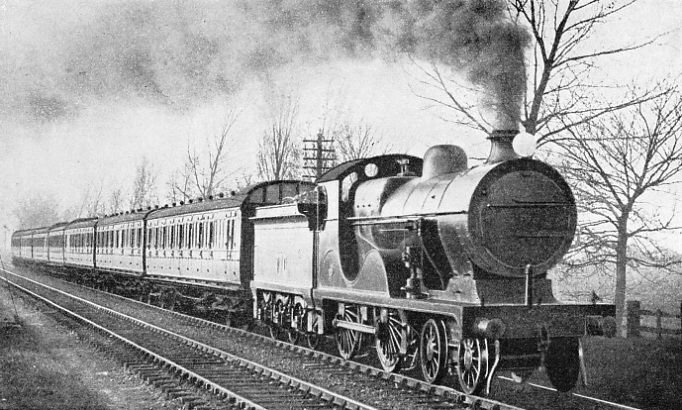 The standard PLM express type of 1900 was a 4-4-0, and this class was a pioneer among “wind cutters”, the ancestors of present-day streamlined locomotives. The Eastern, Western, and Northern Railways of France were also using 4-4-0’s at the same time on their fastest expresses. Those of the Western, introduced in 1892, were followed by further series in 1893 and 1896, and, contrary to the general Continental practice, had inside cylinders. These engines resembled British locomotives, and appeared to incorporate various external features characteristic of the British design of the period. The last quarter of the nineteenth century witnessed a striking change in British express engine practice. Between 1870 and 1875 the construction of new types of “singles” was mainly confined to the Great Western, Great Northern, and London, Brighton and South Coast Railways. It was during this period that the 4-4-0 may be said to have come into its own. It was adopted by the Great Eastern, North Eastern, Glasgow and South Western, North British, Highland, Midland, London and South Western, Manchester, Sheffield and Lincolnshire (afterwards the Great Central), Caledonian, and Great Eastern Railways. ON THE CALEDONIAN RAILWAY. These express engines, designed by J. F. McIntosh, appeared in 1897. Cylinders were 19-in by 26-in, the diameter of driving wheels was 6 ft 6-in, and the diameter of the boiler 4 ft 8½-in. The total heating surface was 1,500 sq ft; grate area was 20.6 sq ft, boiler pressure 175 lb per sq in, and the weight of the engine, without tender, 52 tons 16½ cwt. At this period British engineers were fairly evenly divided in opinion as to the correct position of the cylinders. The London and South Western, North Eastern, Great Eastern, Caledonian, and Highland 4-4-0’s had them outside, and the remainder inside. The first Highland type, which was built in 1873, was a converted 2-4-0 outside-cylinder locomotive, on the lines of the London and North Western’s “Crewe” type. It was fitted with a bogie to enable it to work over a line with severe curves, on which locomotives with a rigid wheelbase had been found unsuitable. Apparently only one of this type was ever at work, but it was followed by a larger class, also with outside cylinders, which remained the company’s standard practice for the next twenty years. Both these classes were equipped with cabs similar in design to those used on the Brighton Railway’s “Gladstones”, “Westminsters”, “Grosvenors”, and other celebrated classes. FITTED WITH A WATER-TUBE FIREBOX, this locomotive was designed in 1904 by D. Drummond for the London and South Western Railway. Cylinders measured 19-in by 26-in, the driving wheels were 6 ft 7-in, the total heating surface was 1,550 sq ft, and the grate area 24 sq ft. The boiler pressure was 175 lb per sq in, and the weight of the engine, without tender, 53 tons 19 cwt. The Great Eastern 4-4-0’s of 1874 were designed by S. W. Johnson, who subsequently became locomotive engineer of the Midland Railway. They had his characteristic spring balance dome, and possessed two features of note: no tenders were built specially for them, and the original fireboxes were of iron, which were, however, replaced two years later by copper fireboxes. They were also the first 4-4-0 engines combining inside cylinders and inside frames to be at work on any English railway. A special feature also characterized the outside-cylinder North Eastern 4-4-0’s that were introduced in 1872 for work on steep gradients. The 17-in cylinders had a stroke of 30 in, a length which remained unmatched in England until used by the Great Western Railway some thirty years later. Johnson’s Midland 4-4-0’s were among the best known of their type. The first class, which was introduced in 1876 had 6 ft 6 in coupled wheels, and was followed during the next year by a class with 7 ft wheels and various alterations in external design. This second class, which had 18 by 26-in cylinders, remained, with varia­tions, the standard practice on the system for many years, in company with Johnson’s bogie single-drivers of the “Princess Beatrice” class. A GREAT WESTERN 4-4-0 of 1895, the “Duke of Cornwall”. Cylinders measured 18-in by 26-in, total heating surface was 1,224 sq ft, area of fire-grate 17.2 sq ft, and diameter of the coupled wheels 5 ft 8-in. The working pressure was 180 lb per sq in, and the weight of the engine in working order, without tender, was 47 tons 6 cwt. The use of outside bearings to all wheels was a noticeable feature of this class. The London and South Western 4-4-0’s of this period were designed by W. G. Beattie or by W. Adams. Both designs had outside cylinders, a characteristic of South Western practice for many years after. Beattie’s engines, which were introduced in 1876, had no splashers in the usual sense of the word, the coupled wheels being surmounted by a closed-in framework resembling a side tank, while the small cab was reminiscent of that employed by Patrick Stirling in his Great Northern “eight- footers”. The locomotives designed by Adams, built at various periods between 1880 and 1887, were of much neater design, and were characterized by another feature that became standard South Western practice - an arrangement ob­viating the customary lower slide-bars. This feature had previously been em­bodied in the design of the 4-4-0’s built by the same engineer for the Great Eastern Railway in 1876. The outside-cylindered 4-4-0’s of this period were on the whole not so satisfactory as those with inside cylinders. This was partly due to the fact that the designs of the outside-cylinder engines in question were characterized by what has been described as “an epidemic of large cylinders and small boilers”. But the position of the cylinders also gave trouble. They neces­sitated thick frames, which added to the weight of the framing and motion, and when, as in the “Beattie” engines, thinner frames were used, the frames were inclined to crack. 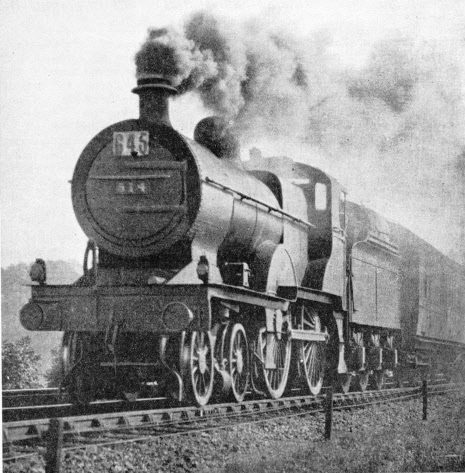 FIRST ENGINE OF THE “PRECURSOR” CLASS designed for the London and North Western Railway in 1904. No. 513 had cylinders 19-in by 26-in. The diameter of the driving wheels was 6 ft 9-in, total heating surface 2,009.7 sq ft, grate area 22.4 sq ft, and boiler pressure 175 lb per sq in. The total weight of the engine, without tender, was 59 tons 15 cwt. Some interesting types of 4-4-0’s were introduced during the ten years to 1890. In 1884 T. W. Worsdell put in service on the Great Eastern Railway a two-cylinder compound similar in general appearance to the locomotives that he built a little later for the North Eastern. These locomotives are de­scribed in the chapter “The Evolution of Compounds”, beginning on page 1046. The last decade of the nineteenth century was characterized by unusually interesting developments on the Great Western Railway, resulting primarily from the abandonment of the broad gauge in 1892. William Dean was then in charge at Swindon, and his forward locomotive policy exercised a marked influence on the time-table. His first 4-4-0 tender engines had an exceptionally interesting history. These were a batch of forty, originally built as saddle tanks between 1887 and 1889, half being designed for the standard gauge from the outset, while the remainder were built as “convertibles”. Except for one with a trailing bogie they were all six-wheelers. Dean converted them to the 4-4-0 tender type, some with domed and some with domeless boilers, the latter class also having raised Belpaire fireboxes. Two of these converted tanks under­went what must rank as a unique expe­rience; they were sold in 1921 to the Cambrian Railways Company, but on grouping in 1923, when the Welsh line amalgamated with the Great Western, they returned to their original ownership. “CORONATION”. This famous engine of 1910 - one of the “George the Fifth” class - was the five thousandth locomotive turned out at the Crewe works of the London and North Western Railway. Its cylinders measured 20½ by 26-in. Locomotives of this type generally resembled the “Precursors”, except that they were superheated and had larger cylinders and extended smokeboxes. The total heating surface, including superheater, was 1849.6 sq ft.
Dean’s first noteworthy 4-4-0 express engines were of the “Duke of Cornwall” class, of which forty were built in three batches between 1895 and 1897. They were preceded, however, by a class of only four engines, numbered 7, 8, 14, and 16. The first two bore the num­bers of the tandem compounds to which reference has been made on page 603, in the chapter on “Unconventional Locomotives”. They were named, respectively, “Armstrong”, “Gooch”, “Charles Saunders”, and “Brunel”, after Great Western celebrities. These engines never gave such satisfaction as any of the subsequent 4-4-0’s, one defect being that they were over-cylindered, the original dimensions being 20-in by 26-in. The diameter was subsequently reduced by one inch, but even that was large in comparison with Great Western practice, since none of the later 4-4-0’s had cylinders of more than 18 in diameter. The “Duke of Cornwall” class embodied a number of special features. These included Belpaire fireboxes, extended smoke-boxes, and tender and bogie wheels of the Mansell carriage type, with wooden centres. Save for an experimental goods engine of the ’eighties, they were the first Great Western locomotives to be equipped with extended smoke-boxes. It is not altogether easy to trace the individual histories of these loco­motives. Some were re-named, and ten were merged into the “Bulldog” class, while the compliment was returned by transferring ten of the “Bulldogs” to the “Duke” series. The “Bulldogs” had somewhat larger and higher pitched boilers than the “Dukes”. The first of the series, which differed in appearance from its successors, was subsequently rebuilt with a domeless boiler and a smaller cab than that originally fitted. Lack of space forbids description of all the Great Western 4-4-0’s, which included the “Badmintons”, the “Camels”, the “Flowers”, and the “Citys”. One of the last, “City of Truro”, set up a speed record with an Ocean Mail Express on May 9, 1904, referred to in the chapter “Locomotive Speed Records”, beginning on page 529. AN EXPRESS ENGINE OF 1899, designed by W. Dean for the Great Western Railway. The cylinders of “Waterford” measured 18-in by 26-in, and the driving wheels were of 6 ft 8-in diameter. “Waterford”, alone of its class, had a domeless boiler. On other systems, some of the most interesting 4-4-0’s introduced during the closing ten years of last century were comp-ounds, as explained in the chapter already mentioned. J. F. McIntosh in 1896; an enlarged version of these 4-4-0’s appeared during the following year, known as the “Dunalastair 2nd”, or “766” class. Features of the latter were the eight-wheeled double-bogie tender and boilers of the then excep­tional diameter of 4 ft 8 in. The design aroused great interest, which was not confined to Great Britain, the Cale­donian engines being closely copied by the Belgian State Railways for express passenger work. Another interesting Scottish 4-4-0 made its appearance in 1897. This was J. Manson’s experimental four-cylinder “simple”, No. 11. Only one of the class was built. It had a common steam chest for the two inside cylinders. No. 11 was reconstructed in 1923 with larger inside cylinders and a super­heater, and with a single piston valve for the inside and outside cylinders on either side, an arrangement that neces­sitated cross ports. On the London and North Western Railway F. W. Webb designed a four-cylinder simple 4-4-0, this being a variant of the “Black Prince” com­pound introduced in 1897, but with two high-pressure inside cylinders of 15-in diameter m place of the 19½-in low-pressure cylinders of “Black Prince”. The designer’s object was both to secure better balancing, and to make a comparison between a four-cylinder simple and a four-cylinder compound of the same class. But the boiler was not of sufficiently large dimen­sions to supply four high-pressure cylinders of this size, and the engine was eventually altered to a compound. All the later four-cylinder locomotives designed by Webb were compounds. A “COUNTY” CLASS ENGINE, designed by G. J. Churchward. Cylinders measured 18-in by 30-in, and the diameter of the driving wheels was 6 ft 8½-in. The total heating surface was 1,818 sq ft, the grate area 20.5 sq ft, and the boiler pressure 200 lb per sq in. The weight of the engine, without tender, was 58 tons 16 cwt. The first engine of this class was built in 1904, but the whole class has now been scrapped. The year 1900 may be regarded as approximately the beginning of the end of the supremacy of the 4-4-0’s in Great Britain. The type gradually gave way - first to the “Atlantic” type, and then to 4-6-0’s and “Pacifics”. But the 4-4-0 had by no means been abandoned. The Great Western “Citys” did not materialize until 1903. The “Counties”, which had outside cyl­inders and the considerable piston stroke of 30 in, appeared in the following year. In 1900 James Holden produced his well-known “Claud Hamiltons” for the Great Eastern Railway. They were the largest Great Eastern express passenger engines built up to that date. As originally designed, they had a heating surface of 1,630 sq ft, which was increased in a later series to 1,706 sq ft. Most of them have since been rebuilt by the LNER. Then there were two well-known London and North Western classes, the “Precursors”, introduced by G. Whale in 1904, and C. J. Bowen Cooke’s super­heated “George the Fifths” of 1910. Over a hundred “Precursors” and ninety “George the Fifths” were built. Many of the “Precursors” have since been fitted with superheaters. At the time of writing the superheated “Pre­cursors” and the “George the Fifths” all survive. At one time they per­formed excellent work on the heaviest and fastest London and North Western expresses; but they are now employed on secondary duties. The main difference between the London and North Western “Precur­sors” and “George the Fifths” was that the “Precursors” used saturated steam, while the later engines were superheated. When the first batch of ten “George the Fifths” was built in 1910, another batch of ten locomotives known as the “Queen Marys” appeared simultaneously. The “Queen Marys” were similar in every way to the “George the Fifths”, except that they were not superheated. Experiments proved the super-heated locomotives to be in every way superior to those using saturated steam, and the ten “Queen Marys” were all fitted with superheaters without delay. The altera­tion of the “Precursors” followed, but more slowly. About fifty of them went unconverted to the scrap-heap. It must not be forgotten that the Midland compounds of the LMS are 4-4-0’s. As these locomotives receive attention in the chapter “The Evo­lution of Compounds”, they need only a passing reference here. The first of this numerous class was built in 1901, the last a few years after the grouping of 1923. In 1913 J. G. Robinson put his “Directors” to work on the Great Central Railway. These have been so successful that they have largely superseded the “Atlantic” type on the owning company’s line, and a further twenty-four have been built since grouping for the LNER. Indeed, the 4-4-0 is so far from being an extinct type that a number of new classes have been introduced since 1923. These include the LNER three-cylinder “Shires”, introduced in 1927, of which a special feature is that the three 17-in cylinders are made in a single casting; and the Southern Rail­way’s “L” class engines, which have done fine work in hauling express trains between London (Charing Cross) and Folkestone Central. Finally, there are the Southern’s “Schools”, which were not introduced until 1930. These have three cylinders 16\ by 26 in, 6 ft 7 in coupled wheels, a heating surface of 1,766 sq ft (excluding the 283 sq ft of the superheater), and a weight, with tender, of 109 tons 10 cwt in working order. The revival of the 4-4-0 type as exemplified in the “Schools” and the “Shires” is significant, as showing that the eight-wheeler still has a useful field of employment for fast passenger work as well as for mixed traffic. The “Shires” were designed for interme­diate service; while the Southern “L” class has demonstrated that the 4-4-0 can still hold its own under arduous operating conditions, provided that train weights are kept within reasonable bounds. The “Schools” are the largest and most powerful 4-4-0’s yet built in Great Britain, and they successfully deal with the most exacting demands of the Southern Railway time-table. AN OIL-BURNING 4-4-0 LOCOMOTIVE on the LMS down line near Ambergate, Derbyshire. This engine, No. 514 (Class 2) is one of a class used for secondary express work. You can read more on “The Coming of the Ten-Wheeler”, “The Evolution of Compounds” and “Unconventional Locomotives” on this website.